Wind farms could provide up to 25 percent of UK electricity. 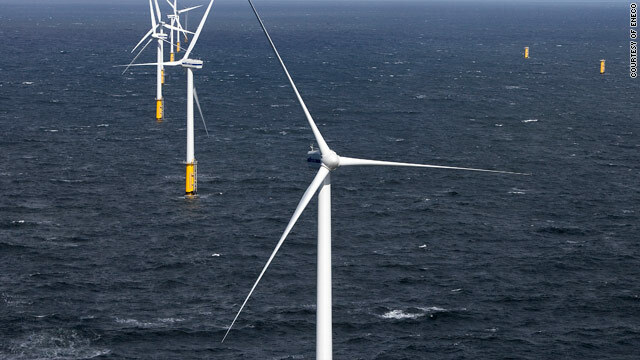 London, England (CNN) -- Britain is about to have a massive expansion in renewable energy after awarding licenses for nine offshore wind farms Friday. The energy generated from the new wind farms will provide a quarter of Britain's electricity needs by 2020, according to the Crown Estate, which awarded the contracts. Companies had bid for the right to build wind farms in nine zones around Britain, from the English Channel to the North Sea off Scotland. The successful bidders must now plan their projects and receive approval before they can build. "Our island has one of the best wind energy resources in Europe and today's news shows we're creating the right conditions for the energy industry to invest in harnessing it," said British Energy Secretary Ed Miliband. The wind farms will be able to offer 32 gigawatts, or about a quarter of Britain's electricity needs, said Roger Bright, chief executive of the Crown Estate. British Prime Minister Gordon Brown said the expansion could provide as many as 70,000 jobs by 2020. He promised to remove any barriers to rapid development. The Crown Estate belongs to the queen and is one of the largest property owners in the United Kingdom. It pays its entire revenue to the British Treasury. It owns half of the United Kingdom's foreshore, 55 percent of tidal river beds and estuaries, and almost the entire seabed out to 12-nautical-mile territorial limit. Under the Energy Act of 2004, the Crown Estate can also issue leases for development beyond the territorial limit, out to 200 nautical miles. Friday's announcement is "the biggest tender for renewables ever," said Antonio Mexia, chairman of EDP Renovaveis, a Portuguese company that won a license to build in the Moray Firth, off Scotland's eastern coast. "This is about delivering a whole new industry for the U.K., one that provides sustainable, secure, and indigenous power as well as tens of thousands of new jobs throughout the supply chain," said Eddie O'Connor, the chief executive of Irish company Mainstream Renewable Power. Mainstream, together with Germany's Siemens Project Ventures, won the license to build off Hornsea, on England's eastern coast.